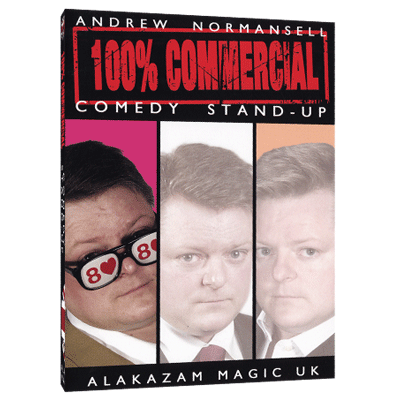 For the past twenty years, Andrew Normansell has made his living performing Magic for some of the most prestigious companies both in the UK, abroad and is a regular on the UK comedy club circuit, one of the most demanding arenas for any performer. Now for the very first time, Andrew reveals some of his best kept secrets along with the routines and visual gags that have been staples in his repertoire and have ensured his clients keep coming back for more. Usually armed with little more than a deck of cards and a smile, this man will entertain and fool you badly at the same time. Whether up on stage or performing mix and mingle at a cocktail party, Andy is always guaranteed to astound and entertain. If you're looking for a video packed with impractical, knuckle busting routines that you will NEVER perform in the real world, then this video is not for you. If however, you want to learn some great Magic that is 100% commercial then keep reading! On this volume Andrew shares with you the following routines: Double Cross including the Moroccan Rising CardAlmost a complete act in itself! A superb presentation piece with any deck, any time, any place, anywhere! Lots of gags and plenty of audience participation! Economy FlightThe classic cards across plot comes full circle with this superb, direct and diabolically simple handling that requires absolutely NO palming! This is the one that you will use immediately! Heat SeekerThis has it all! Stunning, elegant Magic, then a big, big laugh! Andy used this one in comedy clubs for years! If you are searching for a comedy gem, then you have found it! Gag Torn & Restored NapkinAnother superb item from the comedy clubs! Perfect for encores! No Magic but big laughs! SqueekyMore hilarity with a handkerchief! If you entertain, this is another comedy item that you will use. Solid SilverAndrew has used this commercial Coins Across routine in both close up and stand up performances for many years. This routine has been honed under fire in the most demanding of conditions. As with all the best stuff, it packs small and plays very big! Pro Invisible DeckThe classic effect with a new twist! With Andrew's handling and presentation, you will gain maximum impact and as with Andrew's effects, it is 100% commercial!